CORBINIAN, a native of France, who after living for fourteen years as a hermit, was consecrated a missionary bishop to Bavaria. St. Corbinian based his See at Freising and is said to have had a long and successful episcopacy. St. Corbinian reposed in 730. DISIBOD (DISIBODE, DISEN), according to tradition, St. Disibode was an Irishman who, with several companions, worked as missionaries in the east of France and Germany. After ten years he went to Odernheim in present-day Rhineland-Palatinate, Germany where he founded the monastery of Disibodenberg. St. Disibod reposed in 700. ETHELBURGH (ETHELBURGA), St. Ethelburgh was the daughter of King St. Ethelbert of Kent (25th February) and his Frankish wife Queen St. Bertha (1st May). Upon her betrothal to King St. Edwin of Northumbria (12th October) St. Ethelburgh travelled to her new home accompanied by St. Paulinus of York (10th October). There she and St. Paulinus converted her husband and were instrumental, in the conversion of Northumbria, and successfully brought the kingdoms of Kent and Northumbria closer together. Upon the repose of King St. Edwin, St. Ethelburgh and St. Paulinus returned to Kent. There St. Ethelburgh founded a monastery at Lyminge where she served as abbess until her repose circa 647. INA (INE) and ETHELBURGH, King St. Ina of Wessex reigned in England from 688 until 726, and is primarily remembered as the restorer of Glastonbury. In 726, he abdicated his throne, and with his wife, Queen Ethelburga, went to Rome where they lived lives of penance and piety. He was the first to give the alms to the Pope that came to be known as “Peter’s-Pence”, which, contrary to how it evolved, was originally not intended to be a tribute to the Pope but was designated for the maintenance of the English College at Rome. King Ina reposed in 727. KINGSMARK (CYNFARCH), (Fifth Century), a Scottish chieftain, our venerable and God-bearing Father Kingsmark is widely believed to have been married to a granddaughter of King St. Brychan of Brycheiniog (6th April). In later life, he lived in Wales as a monk and disciple of St. Dubricius of Caerleon (14th November). As a monk, St. Kingsmark grew to be renowned for his holiness of life, and soon after his repose was glorified by the Welsh faithful. The area of St. Kingsmark in Monmouthshire, Wales takes its name from him, and there are several churches dedicated to St. Kingsmark in the English West Country and Wales. SERGIUS, born in Palermo Sicily to a family originally from Antioch, he was Pope of Rome from 687 until his repose in 701. St. Sergius enjoyed close relations with the Church in England; baptising St. Cadwalla (20th April), resolving the dispute over St. Wilfrid's (12th October) position as the Ordinary of the See of York, and encouraging St. Willibrord's (7th November) evangelisation of the Frisians. 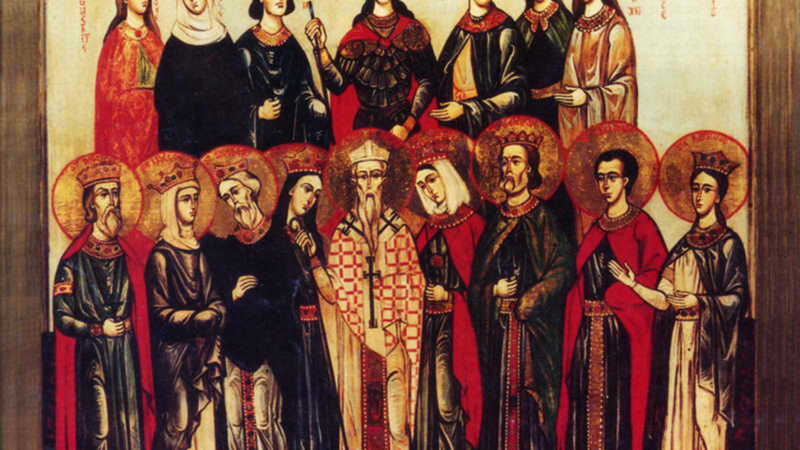 St. Sergius is also credited with introducing the Agnus Dei to the Canon of the Latin Mass.